Ms. Marla Eason was born on Thursday, May 7, 1959 to Edward & Ella Eason. 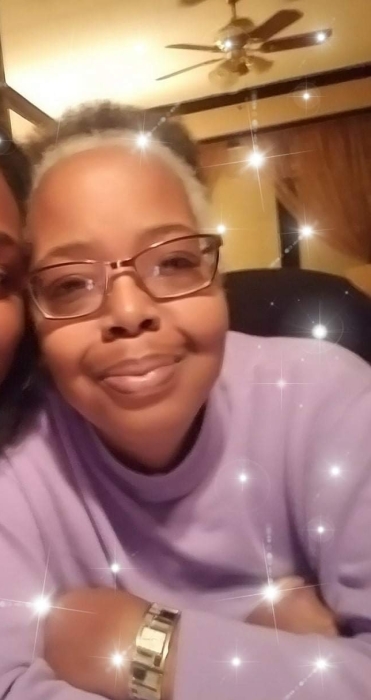 She passed away unexpectedly on Friday, February 1, 2019, in Evanston. A long time resident of Evanston, she leaves behind her only daughter, Patrice Eason, as well as her mother, Ella’s Jean Eason, her siblings Sheryl Lynne, Edward Thomas Jr. (Joyce), Rhonda Jean, and Steven LeGrand (Audrey) and a hoard of nieces, nephews and cousins. She joins her father Edward Thomas Eason Sr. in eternal life. Born in Evanston, IL Marla attended Noyes Elementary, Haven Middle School and finally Graduated from Evanston Township High School with her class 1977. She spent a majority of her life working in the world of banking, but spent the last few years working alongside her warm spirit. She had an immense love for music, Jazz, and R&B and soul, and had a vast record collection that proved it. A single mom, she was a strong woman with a competitive spirit, always looking to win at games played with family on holidays (which wouldn’t be complete without her 7 layer salad). Her culinary and creative talents were her gift to family as she always seemed to be the hub of connection, organization family get together a and cooking for everyone who came, especially her sisters! They were theee peas in pod and a strong force to be reckoned with when all together. Marla was a humble woman, someone who would do anything for anyone, always working to serve others and care for everyone in her life the way only a daughter, mother and auntie would know how.